The B'z Wiki is the number-one resource for B'z lyrics and translations! Here, you will find romaji, kanji, and English translations for every applicable song, and it's all available in multiple formats for your convenience! 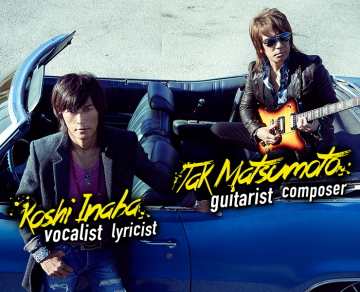 is a Japanese rock band, comprised of guitarist-composer Tak Matsumoto and vocalist-lyricist Koshi Inaba. Since their debut in 1988, B'z have remained one of the most successful music acts in not just their home country but the world, having set a number of records that still stand today. Not only have they remained at the top of the charts for over two decades, they have done so while experimenting with a great many sounds in virtually every imaginable genre. Not sure where to start? Try a random article! B'z is the self-titled debut English album by B'z, released worldwide via iTunes on July 25, 2012. The five-track album contains new English reversions of a selection of popular B'z singles released between 1998 and 2006. The newly-written English lyrics were a collaboration between Koshi and longtime drummer of the band, Shane Gaalaas. New Horizon is the tenth studio album by Tak Matsumoto, released on April 30, 2014. The theme of the album was to explore arenas that Tak had not yet experienced in his musical career thus far. Unlike with the oriental-themed Hana and hard rock release of DRAGON FROM THE WEST, New Horizon sees Tak journey more into the jazz style he began cultivating in his 2010 and 2012 releases. In addition to highlighting guitar in ways he had not previously, the album also features solos for various other instruments, all of which were played freeform. OFF THE LOCK article completed. B'z The Best "Pleasure" article completed. The Ballads ~Love & B'z~ article completed. B'z The Best "Pleasure II" article completed. B'z The "Mixture" article completed. B'z article updated with complete history of 2007. AISHI-AISARE (Lyrics) translated and romanized. Reversion History, Sales & Performance Data added for every B'z song on every single and album. See example here. The B'z Wiki is built by fans for fans. We are always looking for fellow enthusiastic fans to contribute articles. If you would like to join, please click here to learn more and begin helping us expand the number one online English resource for B'z! This page was last modified on 14 June 2018, at 17:35.